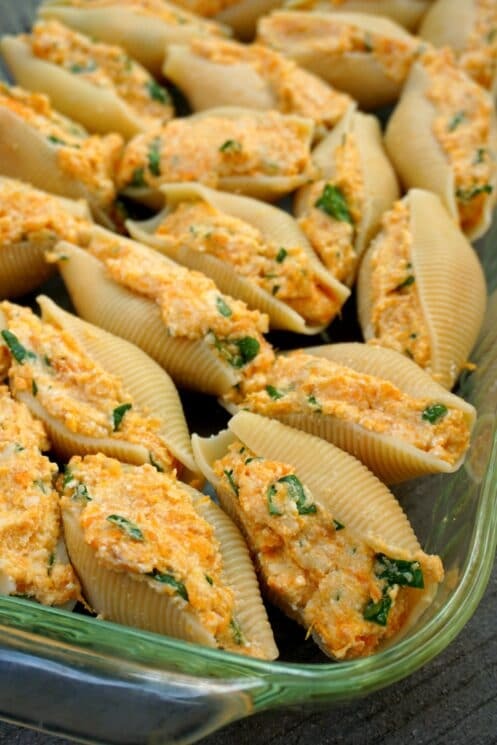 Creamy, sweet, and fun, Sweet Potato Stuffed Shells make a filling, nutrient-rich, vegetarian dinner. Don’t jumbo shells just make you feel fancy and fun? 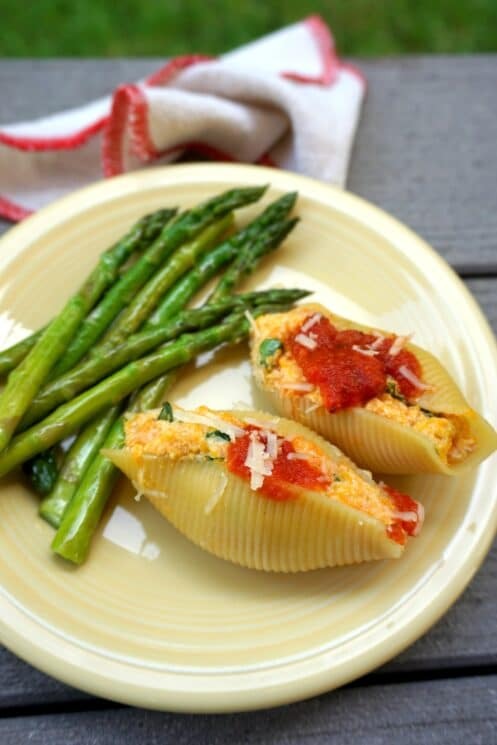 Something about those giant shapes, neatly stuffed with creamy filling and spooned-over with a little marinara sauce, can turn a regular weeknight dinner into something special. These Sweet Potato Stuffed Shells are the best of the best: filling, sweet, and nourishing. They’re full of protein and vegetables and enough style to make you feel proud. Want a bite? We LOVE our orange veggies and shoot for at least one serving a day. Sweet potatoes in particular are chock full of fiber, Vitamin A, Vitamin C, and antioxidants. The deeper the orange hue of your sweets, the higher the concentration of vitamins they contain. We also threw some fresh chopped spinach inside our shells– because a little extra leafy greens are always welcome! 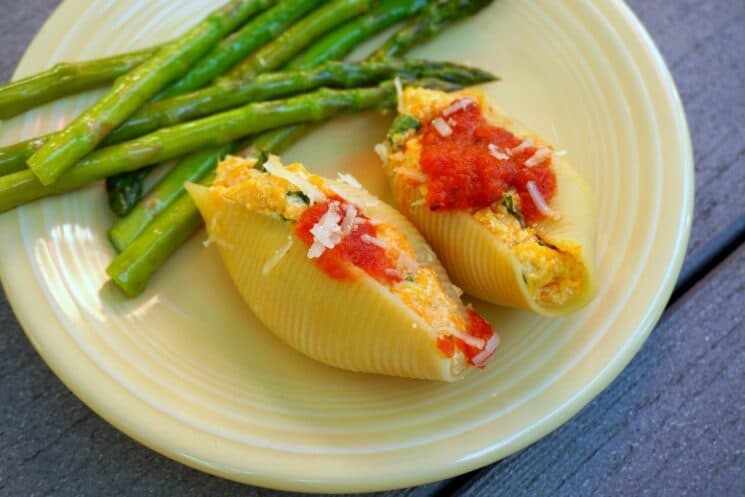 If your kids are luke-warm about spinach and sweet potatoes, they still might dive into these shells. The veggies are mixed with creamy ricotta cheese, and stuffed inside a noodle, after all. On the day you plan to make the shells, mix together the ricotta/sweet potato mixture hours in advance, and store it wrapped in the fridge. Then all you have to do to get dinner on the table is boil the noodles, stuff the pre-made filling inside, and bake. I love it when dinner feels that easy! We paired our pasta with some quick-sauteed asparagus… because WHY NOT more veggies? Remember: the more you offer, the more chances your kids have to taste and accept them. Cook sweet potatoes in the oven for 50-60 minutes or place in the microwave for 8-10 minutes. 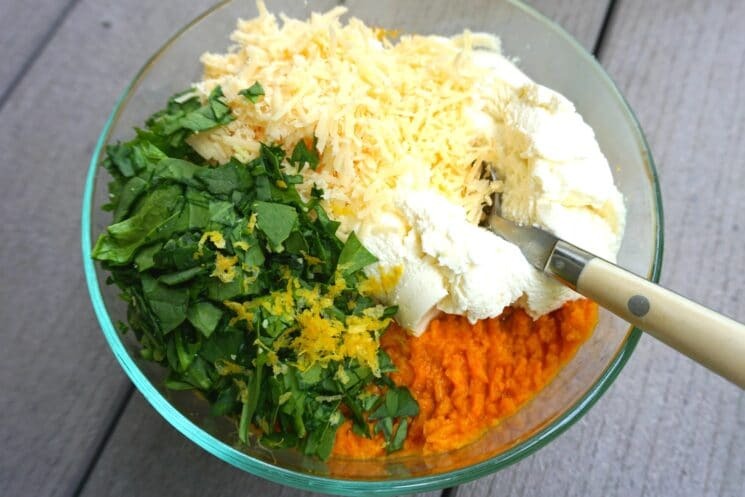 Scrape the sweet potato into a bowl and mash with a fork until smooth. Let it cool to warm room temperature before using. Cook the jumbo pasta shells according to package directions and drain. Finely chop spinach. In a medium bowl, combine the ricotta cheese, Parmesan , garlic, spinach, egg, salt and pepper, fresh lemon juice, and lemon zest. Stir well. 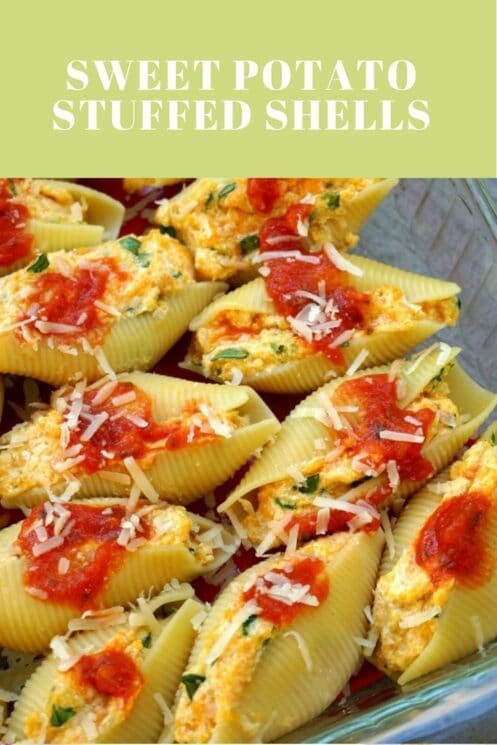 Stuff the cooked pasta shells with the sweet potato/ricotta mixture and place them in a lightly greased 9X13-inch baking dish (depending on how full you fill the shells, you may not use all of them). 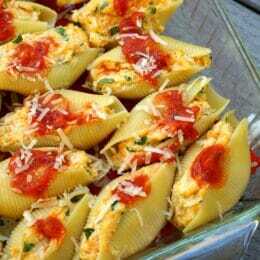 Bake the shells for 18-20 minutes, until they are hot all the way through. Serve with your favorite marinara or Alfredo sauce. The ingredient list includes 2 cloves but they are not addressed in the instructions. Also, do these freeze ok? Could you sub the ricotta with Greek yoghurt? Hi Nonna! Yes, minced works great. I made these with cashew ricotta and nutritional yeast, turned out great! Hi, I’m wondering if you could make this recipe ahead of time (mostly in terms of the sauce) and freeze it that way it’s ready to warm up and serve with freshly cooked pasta. Thanks! I would love a way to add a meat to this (hubby is a huge carnivore ?). Any suggestions for how to incorporate one rather than just make a separate meat? Hi Tia! Your best bet might be to top the shells with a meat sauce like beef bolognese. I wouldn’t try putting meat inside the shells with the other filling, because those flavors are pretty delicate and it might throw the taste off balance. If you try a meat version, please let us know how it turns out! the lemon juice is left out of this???? I’d like to try this recipe but substitute pumpkin or winter squash purée for the sweet potato. The recipe calls for 2 sweet potatoes. How many cups am I looking to get of the 2 sweet potatoes in the recipe? Really enjoyed this! Will make it again. Thanks for the recipe! Can someone please explain what to do with the lemon juice? Thanks! Hi, Cassie! Thanks for catching that. The lemon juice gets mixed in with the rest of the filling. I’ve updated the recipes.